Three suspended cranes and six Verlinde hoists are key pieces of equipment in the injection mould maintenance workshop at Parker Hannifin. Parker Hannifin with a global turnover of €11.5bn is a world leader in movement and control technologies. The company designs, manufactures and markets a wide range of hydraulic, pneumatic and electromechanical components. The Muzillac factory in Brittany employs 130 and is a plastics injection specialist for products of the FSCE division and for the automatic assembly of instant fittings The factory is ISO 9001, ISO 14001 and ISO TS certified and the injection mould maintenance workshop very recently installed three Europont overhead cranes on each one of which is fitted two Verlinde hoists. The moulding workshop is the core production activity at the Muzillac plant. There are 22 Engel, Fanuc or Ferromatik injection presses served by a suspended crane fitted with a 3t Verlinde Eurobloc VT hoist for mould changing operations. These presses are used for the moulding of connectors for small pneumatic hoses and for compressed air system couplings in industrial buildings. For the car industry, five presses are dedicated to the production of motor fuel distribution circuits integrated by Parker Autolive in its manufacturing facilities. The 500sqm workshop dedicated to mould routine maintenance consists of three successive square 10m x 10m work stations. After a certain number of duty cycles, the mould is removed, cleaned ultrasonically and the toolmaker is sometimes required to recondition the spindles by electroerosion or replace possible faulty parts. Before the Europont suspended cranes were installed, a single jib crane served the three workstations. As the manipulation of metallic moulds whose weight varies between 50 and 1500kg necessitates taking numerous precautions, the toolmakers frequently had their work interrupted while awaiting the availability of the jib crane. It was therefore decided to make each station autonomous with its own suspended crane fitted with two Verlinde hoists of a lifting capacity of 1.6t. The three Europont cranes travel on the same metallic structure and to avoid accidental collisions, limit switches guarantee travel safety. Following this new work organisation making each workstation autonomous, the productivity of the mould routine maintenance shop has risen by 25%. As moulds are made of two parts whose sizes and weights vary, each crane is fitted with two Verlinde Eurobloc VT hoists in order to facilitate their manipulation in complete safety. The selected Verlinde Eurobloc VT hoists are fitted with 2-speed motors for lifting and a variable speed motor for horizontal travel. In this way the load is totally controlled horizontally and vertically without any rocking effect. The daisy-chain type power supply is conventional and the control boxes are wired. This solution was in fact preferred to a wireless system for reasons of safety, in order to avoid any possible confusion between the control boxes of the three workstations. 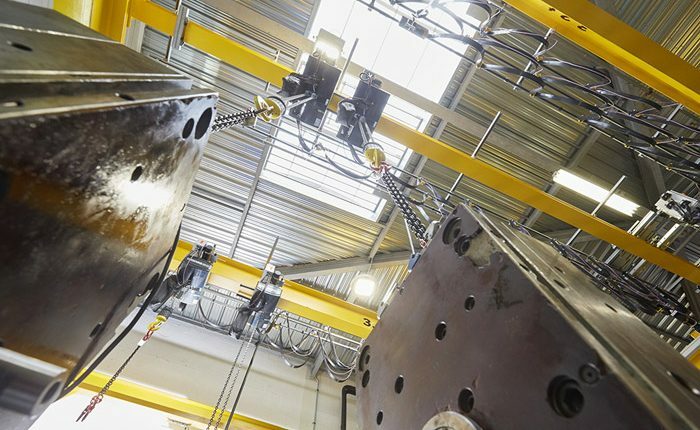 Sere Maintenance, managed by Ludovic Mathis, is a partner of Verlinde and has been a member of the Europont overhead crane manufacturers´ network for more than forty years. A workforce of fifteen ensures the smooth running of the company´s different activities: lifting operations representing 80% of the company´s turnover, together with an activity involving the cathodic protection of metals, mainly for water, gas and compressed air circuits for industry. A whole range of services are also available to customers, such as lifting and handling equipment maintenance.